The UniqueTek office has a classroom that can hold 12 or more students. Classes are instructed by Melodie Anne Coffman M.S., an NRA Certified Instructor. At this time, Melodie instructs only Arizona CCW (Concealed Carry Weapon) in our classroom. The calendar below lists all currently scheduled courses. If you click on a date, it will pop up a window with details about the class and a link where you can register for that class. Instructor: Melodie Anne Coffman, M.S. Melodie has been working in health, wellness and fitness for over a decade. 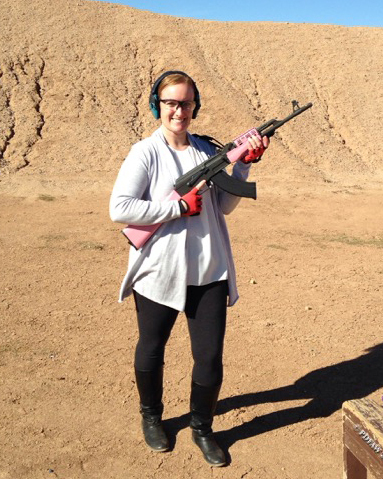 She is a certified instructor through the National Rifle Association (NRA). Her true passion is in women’s defense and women’s basic pistol instruction. Melodie teaches on-site concealed carry weapons (CCW) courses, as well as several NRA-approved pistol and defense courses. Why Do I Need An Arizona CCW (Carrying Concealed Weapons) Permit? Ability to pick up your children from school at the curb with an unloaded firearm in your vehicle. The Arizona CCW permit is recognized (reciprocity) in about three dozen other states. If you plan on traveling and carrying concealed, a CCW permit is a must. NOTE: The list of states granting reciprocity changes frequently, so always check before you travel. One does not need a background check when purchasing a firearm, just show your permit with your identification. You need a CCW permit to carry your firearm in a commercial establishment that serves alcohol for consumption on the premises. If the establishment does not have a "no guns" sign posted, you may carry a concealed firearm inside. However, you may not consume alcohol while in possession of a firearm. One of the perks of having an Arizona CCW permit is that it proves that you have received some sort of firearms training. While Arizona is a Constitutional Carry state, the last thing you want to do is stand in front of a judge and a jury after using deadly force, and argue that you did not have any firearm training because the state does not require it. Things will not work well in your favor. The CCW permit allows you to carry in several National and State parks, including the Grand Canyon.